• Iran and sanctions. As everyone knows, Iran’s President Hassan Rouhani appears open to negotiations on the nature of Iran’s nuclear program, and the U.S., together with other P5+1 nations (U.S., Russia, China, UK, France + Germany) will be holding discussions with Iran’s negotiators in Geneva later this week. This may be one of the last chances for a negotiated solution to the issue, since many commentators suggest that Iran is very close to being able to construct a nuclear weapon, and that act would cross the “redline” for both the U.S. and Israel. Iran is willing to negotiate not only because of the possibility of military action, but also because UN, U.S. and EU sanctions have badly weakened its economic development. The U.S. will encourage Poland to hold the line against any premature weakening of EU sanctions (with both Poland and Germany being countries with much to gain from renewed trade) until a concrete and verifiable agreement with Iran is in place and confirmed by a UN Security Council Resolution. Any early lifting of sanctions could jeopardize significant concessions by Iran. The U.S. may have concerns because of Deputy FM Bogusław Winid’s recent talks with Iranian FM Mohammad Javad Zarif – and FM Sikorski’s upcoming trip to Iran. It will also certainly want to know what Winid learned during his conversations there. • Afghanistan withdrawal. With Poland scheduled to remove its troops from Afghanistan by the end of 2014, the U.S. will want to coordinate withdrawal logistics, to ensure that coverage and liaison in critical areas is maintained. It will also probably try to persuade Poland to maintain its presence through the end of the ISAF mission. Poland has been one of the most significant and effective contributors of forces in Afghanistan, and Secretary Kerry will no doubt thank Polish officials for their steadfast support. The Ministry of National Defense lists 43 Polish soldiers killed in Afghanistan; most recently on September 2, when an unnamed soldier died from wounds at a military hospital in Ramstein, Germany. • Transatlantic Trade and Investment Partnership (TTIP). One economic issue up for discussion is likely to be the proposed U.S.-EU TTIP, which could liberalize one-third of world trade and possibly create more than a million new jobs. Although the concept has support on both sides of the Atlantic, it has run into trouble over harmonization of U.S. and EU regulatory requirements. GMO labeling and tightening banking sector regulation are two sticking points, although some U.S. officials have also charged that the EU is reluctant to remove anti-competitive trade barriers and reduce subsidies which offer member states’ industries a competitive advantage. Most recently, European Parliament President Martin Schulz has called for a “timeout” in negotiations, charging that the NSA spying revelations suggest the U.S. may use unfair means to benefit U.S. businesses. Schulz may have his own motivations in suggesting the suspension as well. The tactic could be seen as strengthening the role of the EP vis a vis the EU Council and Commission, as well as positioning his Socialists and Democrats group against the EP’s European People’s Party. • Poland’s role in NATO and NATO’s role in Poland. Poland has quickly become one of the most important European countries in NATO, and one of only a small handful of countries in Europe that have in recent years increased their investment in national defense and improved the professionalism and capabilities of their armed forces. The current “Steadfast Jazz” NATO exercises – the first large-scale maneuvers dedicated to the Treaty’s Article 5 self-defense obligations in some time – were largely Poland’s brainchild. Despite suggestions that the U.S. takes Poland’s support on defense issues for granted, the U.S. military and European analysts in the State Department now how significant and important that support is. This gives Poland substantial leverage in discussions on issues of significant national importance, such as territorial integrity, cooperation within NATO against potential external threats (convention and non-conventional) from the east. Poland will be looking for U.S. support for its views in the NATO Defense Planning Process (NDPP – a 4-year cycle) and also in any strategic declarations on defense capabilities that may be proposed for future summits. The U.S. will be looking for Poland’s support for the continued existence of NATO as a Transatlantic Alliance, with no formal EU role. • Visa Waiver. The issue will certainly be raised, but it will continue to be an unsatisfying conversation for both sides. Poland rightfully insists that there is no logical or policy reason to exclude one of America’s best friends in Europe from the Visa Waiver Program (VWP), which permits 90-day visa-free tourist or business visits to the U.S. The Obama administration (like the Bush administration before it) agrees, and has ensured that provisions which would permit the extension of the VWP to Poland are in immigration reform legislation which is currently pending in the U.S. Congress. Unfortunately, the bill is bogged down and not likely to pass anytime soon. The President has no authority on his own to change the law, so visas will continue to be a sore point in the bilateral relationship. • NSA spying. Finally, it’s unlikely that Secretary Kerry will be able to escape a scolding over revelations that the NSA intercepted the telephone conversations of EU leaders and at least the meta-data on calls made by millions of EU citizens. Recent articles have indicated that the U.S. was by no means alone in gathering this intelligence, and obtained much of it with the knowing and authorized cooperation of European intelligence agencies, but there will and should be a discussion of where to draw the line. 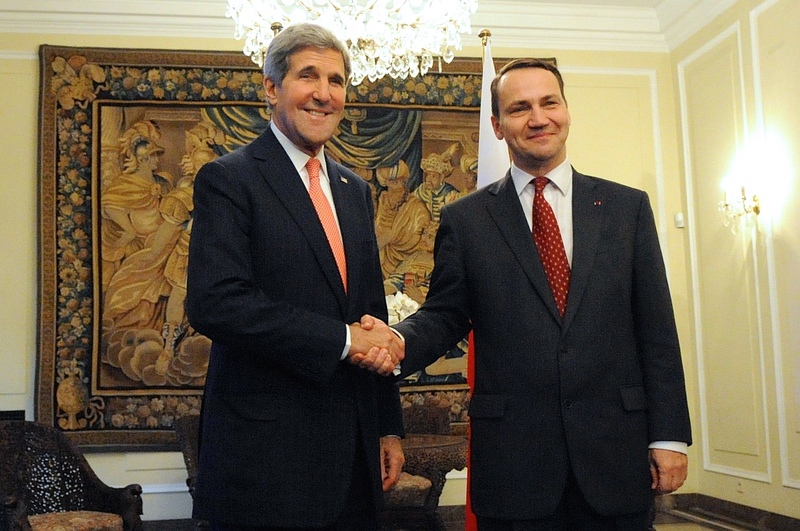 FM Sikorski will likely demand that the U.S. cease collecting any information on the Polish leadership, and Kerry will respond will assurances that the Obama administration intends to stop any spying on its friends’ heads of state and government in the future. The countries will continue their long-standing cooperation on intelligence issues. While there’s no guarantee the topics above will be on the table, Secretary Kerry’s visit to Poland is certain to force a closer examination of the bilateral relationship, which for both countries will be a good thing.